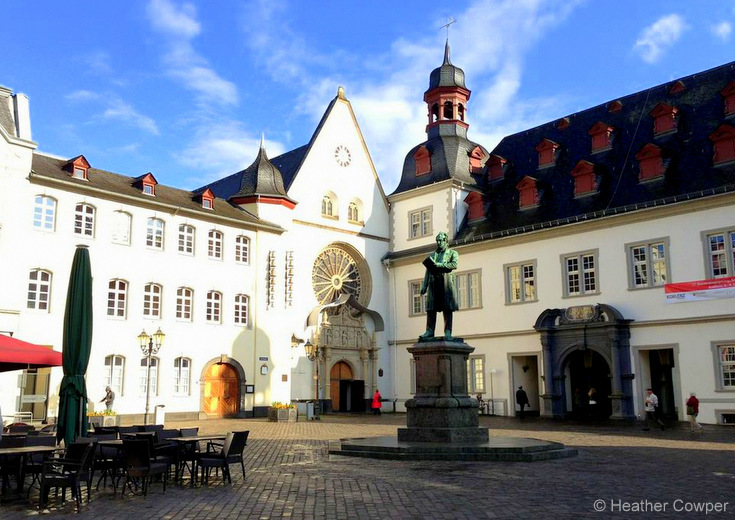 Our day began in Rüdesheim with a walking tour of this charming small town, the highlight of which was the music museum. An old manor house houses a collection of mechanical musical instruments, bought and restored by Siegfried Wendel, with everything from a colourful fairground organ to a tiny music box. As we walked through each room, the guide set each of the instruments to play in turn, including a phonograph invented by Thomas Edison. It required a fresh needle to play every record and had no volume control, resulting in the expression, ‘put a sock in it’, as this was exactly what they did to turn the sound down. We finished our visit to Rüdesheim with a walk down the narrow street filled with taverns and wine shops, known as the Drosselgasse where we stopped to try the local specialty of a Rüdesheimer coffee, a delicious concoction of flamed brandy, mixed with coffee, topped with whipped cream and sprinkled with chocolate. In the days when it was considered unseemly for women to drink in public, this was the way they could enjoy a secret tipple with their friends. Later in the morning, the Amadeus Princess sailed from Rüdesheim, passing through the sloping vineyards and romantic scenery of the Middle Rhine valley. This area of the Rhine has many castles set high above the river that were built in the Middle Ages by local princes, in order to tax the merchandise being transported along the river. We passed the high cliff, known as the Loreley, where only a narrow channel of the river is navigable, causing many ships to founder at this point of the Rhine. The legend has it that a beautiful maiden sits on the rock, distracting the sailors with her singing, a bit like the sirens in the tale of Odysseus. As our previous days had been busy with sightseeing, we really enjoyed the chance to relax on the top deck and enjoy the picturesque castles and scenery. In the afternoon we reached Koblenz, named after the confluence of the rivers Moselle and Rhine. Over 80 percent of the town was destroyed by Allied bombing in the Second World War and the retreating Germans finished the job by blowing up all the bridges. Our walking tour took as past the confluence of the rivers, where all the flags of the German states were flying, as well as an American Stars and Stripes that the Germans added in solidarity after the bombings of 9/11. While Brussels has the Manneken Pis, Koblenz has a statue of a young boy spitting, which soaks the unwary every few minutes if you stand in front of it. Our tour ended at 6pm under the church clock to watch the face that rolls its eyes and sticks out its tongue six times as the clock strikes. Tomorrow our journey with Lüftner Cruises continues to Cochem where we are looking forward to tasting some local Moselle wines. Heather’s Rhine River Cruise was hosted by Lüftner Cruises who specialise in European river cruises on the Rhine, Danube, Rhône and other destinations in Europe, with personal service and Austrian hospitality.